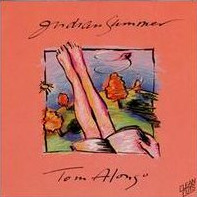 Indian Summer is Tom Alonso's first album. Releasing in 1992 and featuring not only a large ensemble of extremely talented instrumentalists, but also Alonso himself on keyboard, it was received extremely positively by critics and remains a beautiful sample of Alonso's style. It can be purchased here. With more than three dozen "new acoustic" musicians, the eight original compositions by keyboardist, percussionist and guitarist Tom Alonso in "Indian Summer" (Clean Cuts, dist. by Rounder) straddle new age, jazz and orchestral sounds. This has everything from keyboards to guitars, saxophone, violin, oboe, bassoon, flute, tuba, and occasional vocals and chorus. Alonso's tracks are uncommon, fun and musically challenging. Listen for movie star voices in "Screenscape," which has the sound of a Hollywood score. If you want a break from the ordinary, it's the one to try. Simply put, Indian Summer is an anthology of peaceful music - a celebration of the spiritual and uplifting. You're right, it is New Age. So, we could argue the merits and validity of the aforementioned soundscape, or we could just enjoy the LP for what it is - a collection of marvelous aural portraits painted with the touch of a master. Considering the immeasurable talents of keyboard wiz, Tom Alonso, and his supporting cast (which includes the likes of Dennis Chambers, Carl Filipiak, David Rhen, Ashton, Fletcher, and a host of local notables), I'd go with the latter. On more than one occasion, Alonso brings a deft new age sensibility to his piano, but while his chording may recall a George Winston, his inherent melodicism seems drawn more from folk tradition - like the plaintive flow of the title track, or the gentle strains of "Pearl". His ideas are succinct, well-developed, and highly creative, and consequently, can cover a lot of musical ground in a four or five minute time span. Still, Alonso doesn't avoid the dying art (outside of contemporary classical) of long-form composition. His work in the expansive formats of the title-track, "The Cold Coffee Suite", and "Screenscape" takes simple melodies and moves through theme and variations - breaking them up, and shifting hem among the instrumental wash of choral harmonies, guitars, brass, woodwinds, and light (but forceful) percussion. The three opuses are a floatation device for your soul. Elsewhere, tracks like "Blue Heart" (a Nils Lofgren composition) and "This Rain" (with marching, precision-like piano work - his left hand as busy as his right) strike a rare balance between literacy and emotion. Wildly rhapsodic, the two tracks cover a wide range of feeling in mere moments. Yet the emotional content never seems forced or contrived. There's nothing here so overpowering that it will floor you immediately. The intricacies of this effort become clearer only after repeated listenings. The reward is worth the effort. There is a lapse in the effort's overall flow - albeit a minor one. Although a clever idea, "Mashed Potato Valley Breakdown" sticks out like a sore thumb with it's "Hoe down" meets the "Marlboro Theme" premise. Its cutesy approach doesn't bode well among the bursting atmosphere of the mood pieces. For its genre, Indian Summer exudes a warmth not often found among its peers. Most of that comes from knowing that actual humans are touching keys, blowing reeds, and banging drum heads - not cold, calculated machinery. With its rapturous imagery and its exuberance of instrumental juxtaposition, you technically don’t just listen to Indian Summer, you become involved in it. Keyboardist-composer Tom Alonso issues forth an impressive collection of moodscapes in Indian Summer (Clean Cuts, CCD 711; 53:36). Alonso's assets are many. There's his rich harmonic palette, and evocatively bold melodies. There's also an impressive rhythmic verve, and the ability to handle a covey of classical strings and voices without letting things get bloated or heavy-handed. Indeed, the music is fresh, and alive, due in no small part to the smart work of drummer Dennis Chambers and bassist Ashton Fletcher. Alonso's playing is another plus. So, too, is his ability to sketch in longer forms as with the postmodern pastiche, "Cold Coffee Suite," a time-warp intersection where Mozart meets Rudy Vallee (among others), in a manner reminiscent of Lalo Schifrin's brilliant Dissection and Reconstruction of Music from the Past as Performed by the Inmates of Lalo Schifrin's Demented Ensemble as a Tribute to the Memory of the Marquis de Sade (Verve; 1966). Conventional wisdom often indicates a musician's solo debut in the smooth age category will be predictable or overproduced and bland. Keyboardist/composer Alonso certainly turned turtle this notion. His influences include Copeland, Van Dyke Parks, Gershwin, Moondog and Rudy Valee. This combines small orchestral voicings with electronic textures, jazz musicians, tape samples and other elements that produced unusually moving music. "Mashed Potato Valley Breakdown" reminded me of the "Theme From the Magnificent Seven" peppered with peyote buttons (that's a compliment). "Screenscape" alone is worth the price of admission with the sound of a Hollywood score and a brief collage of movie star dialogue.